An interesting mix between a platform game and a education application program. As a brave Spidi, the player has to complete 4 levels full of obstacles and surprises. During this quest, the player must solve mathematic equations... 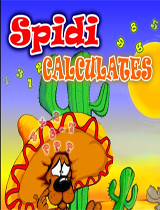 Thanks to Spidi Calculates, every child will be learning mathematics in no time. Comments: Would be alot more fun if only the mouse was needed to play this kid game. Comments: This is a cute game to help children reinforce their math skills. The only drawback is having to use the arrows on the keyboard rather than the mouse to play.